20 years later, there’s a new threat. From the creator of the always respectful and family-friendly The Boondocks comes Black Jesus. In this, the titular character lives in Compton, CA, curses heavily, smokes weed, and runs with a ragged posse of pseudo-disciples. 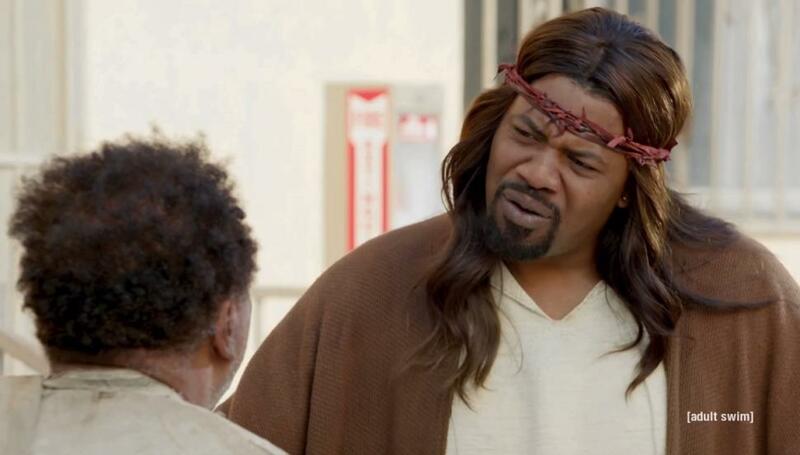 Because you can’t tell if Black Jesus is supposed to be real or just some crazy who just thinks he’s Jesus, you really don’t know how offended to be. My mother protested Universal Pictures’ 1988 release The Last Temptation of Christ for its depiction of Jesus in sexual situations. I didn’t picket with her, but I sure borrowed her anger. I boycotted Universal’s music and movies for years until I realized— I wasn’t upset. I never had the chance to be. I never saw the film or read about it, but I was angry because others were. Basically, if you can’t explain exactly why you’re mad, you need to either find out or put your picket sign down. Jay Parini writes of his initial look at Black Jesus, “As a Christian myself, I like the idea of seeing Jesus return in various guises, skin colors, outfits and social contexts.” So do I. But this show’s biblical inaccuracy carries the same problems as Darren Aronofsky’s Noah film. Nonetheless, my mother— who has mellowed considerably since 1988— did not boycott Noah. She was pleased Hollywood took interest in something of biblical origin, enjoyed the fictional story, and kept her blood pressure low. Speaking of mothers, in grade school, the rule was: if someone insults your mother, you have to fight them. But the school principal never accepted that as an excuse for beating up Burt Gamble* (who had it coming anyway). Eventually I understood that things said on a playground don’t have power. My mom wasn’t a garden tool before the little ratboy said so, and she wasn’t one because of it. I won by learning to let it go. When Jesus was spat on, maligned, and ridiculed on his way to the cross, he didn’t implore the disciples to defend him. So why must we demand that heathens reverence our God? We fling mud at every other deity because the Bible says Jesus is the only living God. But if we can dish it, we have to take it too. Jesus prayed, “Father forgive them, they know not what they do.” We may need to do the same. A friend says he’s boycotting Black Jesus because Christians are supposed to contend for the faith. But Christians rarely venture outside the whiny, bickering, plaintive style of contending. Did you know there were other ways? The play The Book of Mormon was wantonly irreverent and immeasurably offensive to the church of Jesus Christ of Latter Day Saints. Even I was inclined to repent after laughing my face off at its blatant blasphemy. 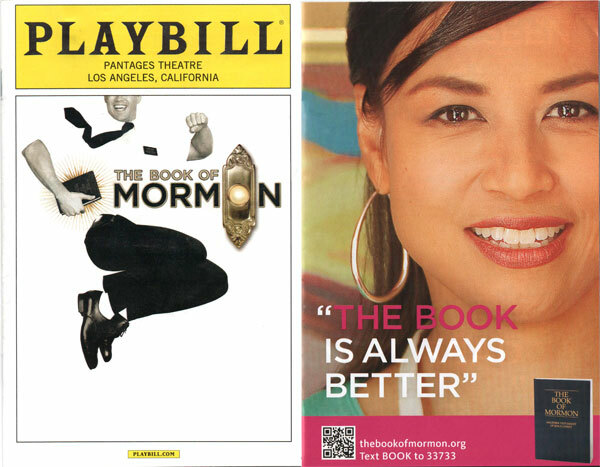 Amazingly though, in the playbill, the LDS Church took out multiple full page ads touting witty slogans like “the book is always better” and “you’ve seen the play, now read the book.” Game. Set. Match. This group took something that lambasted the deepest origins of their culture, harnessed it fearlessly, and made its momentum work for their cause. This TV show has the name Jesus on everyone’s lips and it’s a rare opportunity. As a Christian, now is a good time to get over yourself. Come embrace this culture with some love and truth while they’re in the mood to be touched. For now, Christians seem stopped at the surface of their offense, fighting Black Jesus on the playground for calling our mother a garden tool. Be warned, though. For its first night debut, it achieved top ratings among cable shows. The spotlight’s on our savior even if it’s unflattering light. So if this show isn’t cancelled as fast as you hope it might be, you better come up with some counter-culture ingenuity to capitalize on it quick. Selah. *I wrote a short story about what a renegade child Burt Gamble was, but I lost the story on the playground. A teacher found it, returned it to me, took notice that my writing was really good and encouraged me to continue. So Burt, if you find this, thank you for inspiring my first piece of creative writing. And if you’re mad, come see me on the playground. Black Jesus in concept doesnt upset me. But I don’t engage with things that are disrespectful to my God. I’m just now learning to be more forgiving of people who slam Christianity like it’s their job because I want to be involved in Progressive social justice activities that impact me and people who look like me, and disrespect of Christ kind of comes with that territory, unfortunately. And by getting beyond that disrespect, I can engage people who are working on issues that matter to me, and ultimately align with the cause of Christ. I can also expose those people to a different understanding of Christianity, so there is double benefit in engaging. That benefit doesn’t exist in Black Jesus. Jesus is often on people’s lips when they’re cursing. That doesn’t bring glory to God either, so I’m not impressed with this show. I know plenty of Christians doing way more for people than boycotting things. I often try and find a way to embrace pop culture by pointing out biblical lessons from it, like I’ve done with Twilight, Lord of the Rings, Scandal, Mad Men, Grey’s etc. on my blog, but none of those are Black Jesus. I’m just not going to engage that. It’s not actually funny and neither is the concept of Jesus smoking weed and cursing. I am more disappointed that the Black Jesus in McGruder’s mind feeds into so many stereotypes about Black people and I won’t be supporting it. I can’t really disagree with you. This show is pointedly offensive!! No one would blame you for not supporting the show. The people I take issue with are those who go along with the tide getting angry because they heard that they SHOULD be. That’s not the best. But again, I’m against Christendom starting to act like the Beyhive, railing against all naysayers without giving them a stitch of due process or the space to disagree. There’s an endless amount wrong with Black Jesus, but I hope there will be people who are called to jump into the middle of this fray and be light even when it’s this dark. I know they’re out there. Everybody ain’t called to that — and I might not be either. I’m just asking the questions! But thank you for reading and imparting some truth and solid perspective! Hey Pastor Daniel, thanks for reading! God bless! Only you Mark!! I think I like the idea of seeing how to capitalize on an issue, rather than reacting to the surface offense and making that the end of our concern. God help us to think outside the box and maintain our sanctity at the same time. I believe its possible (because He said “all things are possible..”).